LIFE’S BETTER ON THE WATER. State Dock Marina is a prized jewel in Kentucky. Nestled along the shores of Cumberland Lake, the houseboat capital of the world. With 1,200 miles of shoreline, astounding waterfalls and countless secret coves awaiting you, time just melts away when you’re here. Spend your vacation cruising, skiing, fishing or just living the good life on board a custom houseboat from State Dock. Started in 2010, the Lake Cumberland Raft-Up began as an attempt to break the Guinness world record with the largest number of boats rafted together simultaneously. We shattered the record, and each year, the Raft-Up gets bigger and better than ever before. 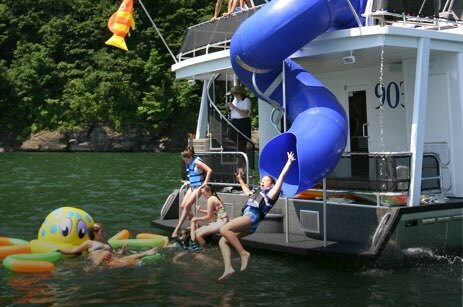 It has become the signature event on Lake Cumberland, so come join us for a day of wild fun. The Lake Cumberland Poker Run is back and better than ever! We've got a great event planned for this year, with more boats and the most unbelievable atmosphere you will ever be a part of!